Washington Monthly | Do Voters Discriminate Against Fat Candidates? Do Voters Discriminate Against Fat Candidates? Jon Corzine seemed to hope so. A Wall Street Journal reporter thought the opposite, trolling message boards in 2008 for people who resented Obama for not being fat. Here is some evidence, courtesy of a new paper presented at the 2011 APSA meeting. The authors are Beth Miller, Jennifer Lundgren, Diane Filion, and Lauren Thompson. 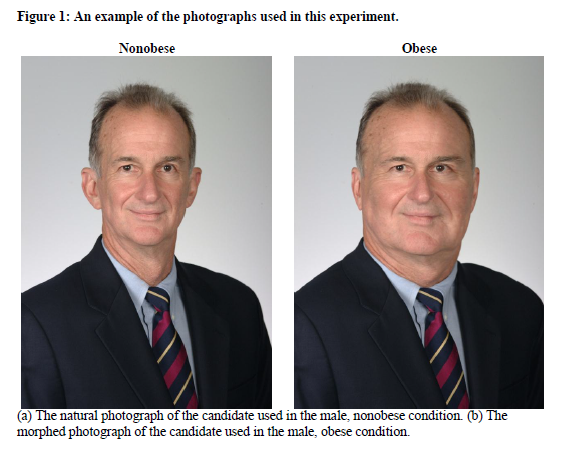 Miller and colleagues find that obese male candidates were actually evaluated more positively than non-obese male candidates. Obese female candidates, however, were evaluated essentially the same or less positively than non-obese female candidates, depending on the measure of evaluation. Moreover, obese female candidates also elicited a stronger negative emotional reaction, as measured by the participants’ startle reflex. This finding may stem from the pressure in western society on women to be thin and men to have greater muscle mass. There’s lots more in the paper to chew on.